Born November 3rd, 1945 Mark is an unheralded Philly jazz institution: self taught, prodigiously gifted, obscure . . . yet among musicians his reputation could not be heavier; his list of credits as an accompanist and arranger reads like a modern jazz encyclopedia. (Nate Chinen.) Numerous critics have favorably compared Kramer's style to that of Bill Evans, Keith Jarrett, and Herbie Hancock, but one which is singularly his own. He is credited with inventing a rich harmonic vocabulary and a distinctive pianistic style, nearly, if not fully, in tandem with the above masters. From age four, Mark was classically trained on violin by members of the Philadelphia Orchestra. In his mid-teens, Kramer shifted entirely to bass, saxophone and piano, and then focused entirely on jazz piano. In the early years, Kramer played piano regularly with Randy and Mike Brecker, Charles Fambrough, Stanley Clarke, Eric Gravatt, Sonny Fortune and many other Philadelphia jazz giants. Arguably, an unwritten portion of jazz history took place at Mark's apartment on Ridge avenue in Philly. There one would find Charles Fambrough, Eric Gravatt, Mike and Randy Brecker, Daryl Brown, Stanley Clarke and so many others assembled for hours/days of non-stop jamming and recording. Mark still plays with and/or produces records with Fambrough, Randy, and Gravatt. Mark is best known for his work with the Mark Kramer Trio. Originally conceived as an acoustic-electric-fusion group in the late 1970s - featuring Paul Klinefelter on bass, and Mike Dougherty on drums - it would quickly mature into a complex acoustic chamber ensemble. Over the years the trio performed several times weekly at clubs and concert halls, and won numerous awards and commendations (see below). In the late 80s, Mark Kramer's trio (mainly consisting of Bill Miller, bass and Butch Reed, drums) hosted approximately 50 world class but regional guest artist/soloists (including Junior Cook, Lee Konitz, George Coleman, Steve Turre, Bobby Watson, Al Cohn, Tal Farlow, Archie Shepp, and several dozen more) at Si Ristorantee Jazz in Philadelphia - a perfectly appointed jazz club owned by Gianfranco Cherici. These concerts were generally SRO, most were recorded, and are currently archived. During that time Mark's trio was featured in major print media weekly, and was broadcast on New Year's Eve by Tobias Poole of nationally acclaimed FM radio station WRTI. Subsequently, for 13-14 years Mark Kramer served as the Jazz Director at Ye Olde Temperance House, a club in Bucks County. PA. The Mark Kramer Trio was the house trio playing up to 4-5 nights weekly. His group (featuring over the years mainly bassists William Zinno, Matt Parrish, Gary Mazzaroppi [see Marion McPartland], DeWitt Kay, Fred Weiss, Scott Lee, Mike Richmond, Charles Fambrough/others and drummers Butch Reed, John Mosemann, Glenn Davis, Dave Moan, Joe Chambers/others) accompanied approximately 300 guest artists mostly from Philadelphia, New Jersey and New York. For 2 years Mark and Arnie Lawrence played together there weekly. (Lawrence was the co-founder of the New School of Music Jazz program.) Outside of Philly proper, Ye Olde Temperance House received Philadelphia magazine's coveted Best of Philly Award in 1999. In the ensuing years, Kramer's trio would go on to record about 7 more jazz versions of complete Broadway shows. In the same year (2001), Mark mentioned to Eddie Gomez [bassist with pianist Bill Evans for 11 years] that Mark would be available on a full-time basis to travel, record, and generally revitalize their 12 year collaboration. Mark and Eddie thus quickly formed the Eddie Gomez-Mark Kramer Production Company and Trio, began to catalog and remix a backlog of their recordings - three CDs worth]. In 2002, they also recorded afresh their trio's Jazz Fiddler on the Roof, co-released on MYTHIC JAZZ RECORDS and TARA records, and subsequently re-released in 2004 on the internationally distributed TWINZ record label. The show's composer Jerry Bock [Too Close for Comfort, etc.] opined that the Eddie Gomez-Mark Kramer version of the show is a true transformation, a masterpiece; bringing tears of joy; I am honored and my gratitude knows no bounds. Currently Eddie and Mark are featured in each others' groups, and as co-leaders on joint projects. Around the same time as the recording of Fiddler, The Mark Kramer Trio completed its ambitious recording of Harry Potter Jazz, vol. 1 (Sorcerer's-Philosopher s Stone) based on the intriguing score by composer John Williams. After a several year delay due to Warner Brothers, the CD was released internationally by a non-major label, once instances of compulsory licensing were demonstrated. In early 2003, Mark co-produced, engineered, and played piano on a Tribute to Rosemary Clooney and Peggy Lee featuring two local Philadelphia vocalists as well as a local trumpeter John Swana [see CRISS CROSS records] and saxophonist Larry McKenna [see DREAMBOX MEDIA]. In July-August 2003, Mark Kramer (playing along with Charles Fambrough, Lennie White, Mulgrew Miller, George Colligan, Steven Johns, and Marlan Simon) engineered Stonejazz a jazz tribute to the Rolling Stones — distributed through Warner Brothers EA. The CD charted nationally in the top 20 for weeks. 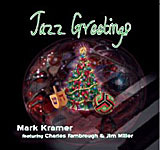 Later that year Fambrough, Kramer and drummer Jim Miller would record Jazz Greetings an unusual Christmas CD, released in 2008-9, as recently reviewed in AAJ. In about 2005, completed a near note for note trio jazz rendition of Mozart's Symphony in G minor (K.550); the world's first complete classical Symphony by a jazz trio. Kramer and Gomez have recently released TROUBLED TIMES (2008) and KIND of TRIO (2009) on the Eroica Label. Both of these works are scheduled for distribution to media in 2010. Overall, Mark has recorded several dozen records as leader and sideman. Mark also has been an invited lecturer at Rutger's University and The New School of Music on the Art of the Jazz Trio and Jazz Harmony. Together Eddie Gomez and Mark Kramer have provided demonstrations on interactive improvisation at major universities. Eddie and Mark are also currently recording new original music and as of 2010 are still working together, the most recent being a tour of 8 theaters (Joe LaBarbera on Drums) in April of 2010. With all of this activity, why then is Mark Kramer still a relatively obscure jazz pianist? The unstated fact of Mark's jazz career is that he had been pre-occupied. 1) It is only in 2001-2 that he went full-time into music. Thus, most of his milestones in the field of jazz took place even as he worked both as an MD and PhD (Temple), 80 hour weeks as the head of Psychopharmacology at Merck Research Laboratories. Merck and Co. - a very large corporation. A point of fact is that Kramer's high profile career in medical research (a first author in the premier Journal of SCIENCE) was not often known to his jazz collaborators, nor was his jazz career known to most of his scientist colleagues. Until recently, Mark Kramer kept these areas of his life separate so they would not cloud the issue of professional qualifications, lead to gimmicky reviews, such as might be advanced by people in either field. Currently, this is not an issue, as he now works almost entirely as a musician. 2) a faulty electrical bathroom fixure caused a fire which consumed his entire house and recording studio in early 2004 (as he played a concert at Merkin Hall, NYC.) It was not until 2007-8 that he would re-construct his life and home and studio. Ears and brain(s), on temporary license. ”. . .an amazing piano player . . . takes chances . . . utilizes fresh and interesting harmonies. . . freely manipulates rhythm. Piano becomes a living, breathing thing under his hands . . melodies are colored with taste and style . . .comping always cushions, and appropriate . . solos always an exciting journey . . .swings hard in places. ” Dave Miele, JazzImprov Magazine. All About Jazz musician pages are maintained by musicians, publicists and trusted members like you. Interested? Tell us why you would like to improve the Mark Kramer musician page.